*All venues include a night's stay for the couple in the Lorene House. Refreshments are provided for the couple for their special night, and breakfast the next morning will be left on the front porch for the newlyweds to enjoy at their leisure. 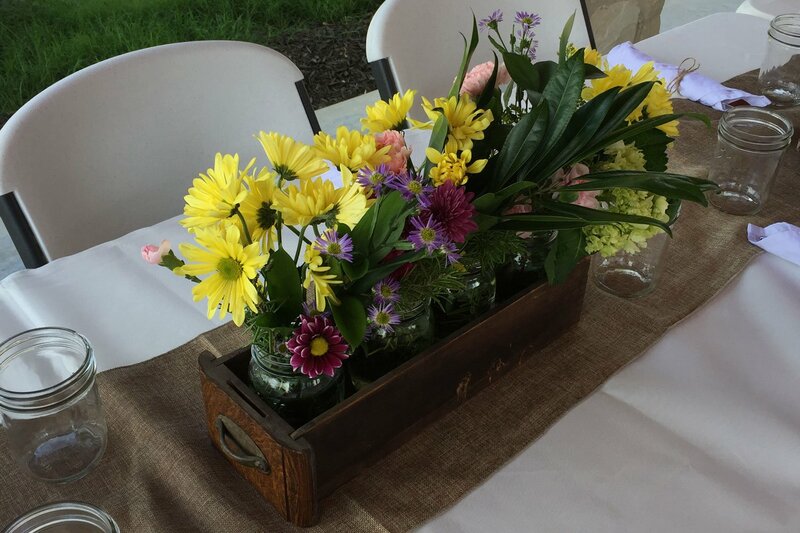 All receptions take place near and around the barn and porch or in the open air Pavillion. Each of the three wedding packages at Glory Hills Ranch are designed to provide a memorable, Christian venue to help you celebrate your special day. The scenic hill country landscape make for a peaceful and serene environment on your wedding day. We hope that your love is enduring and your marriage is full of laughter and joy. Let us help you celebrate! At Glory Hills Ranch, we offer four beautiful spots for your “I do's.” First, the open air Pavillion which has the hill country charm design...cedar columns rocked half way up, high beamed cedar ceiling including lights, chandeliers, and fan...all nestled up against trees surrounded by plants and rocks visited by an occasional deer which may want to observe the festivities. The Pavillion can also be used as the reception area if you choose another one of the locations for the ceremony. If you like, you can be joined as man and wife under a cluster of trees near the Pavillion that beckon you to stand under them and declare your love for one another. Then everyone can happily walk over to the Pavillion and enjoy refreshments. The second spot is at the Cricket House which has multiple stairs descending from a large covered porch. The beautiful bride can walk up the stairs to join her happy groom or she can come out of the front door and descend the steps to her man. Whatever your fancy, it is a beautiful setting for the bride and groom and their attendants. Get your cameras ready! The third area is called LaVentana which is the Spanish word for 'the window'. It is a beautiful place and a nice setting for one of the smaller venues. 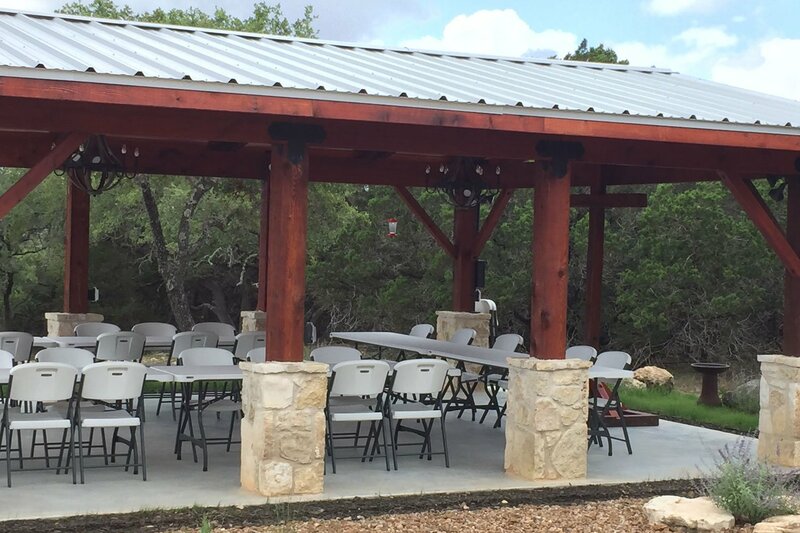 This site has a small rustic cabana set on a hill overlooking the acreage of the ranch in which the bride and groom can stand for the ceremony. There have been many creative and amazing pictures snapped at this location. At sunset, the scene is absolutely gorgeous in the Texas Hill Country. Last of all, for a very small and intimate ceremony, the Lorene House has a porch area or a small, grassy area under the trees. Either spot provides a peaceful place to say your vows. *Rooms are available to rent in the Cricket at a discounted rate of $100 per night. 2 guests only per room. Continental breakfast served. White banquet tables and white folding chairs. Champagne colored table cloths at request. The Cricket House for the bride and attendants to dress. The Lorene House for the groom and attendants to dress. Transportation before the ceremony to the wedding site on the ranch. 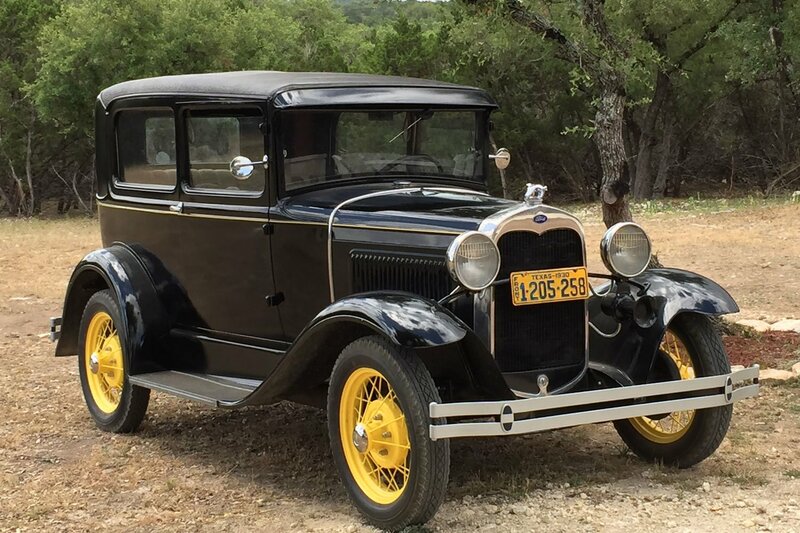 Vintage pick-up or car to carry the bride to the wedding. (La Ventana location not included). Full kitchen for the caterers. Covered wagon for serving, sign in, etc. 1 large easel and chalkboard.